We’d love your help. Let us know what’s wrong with this preview of She Must Be Mad by Charly Cox. She Must be Mad explores coming-of-age: the pain and beauty of love, the relief and the agony of turning from girl to woman, the isolation of an untethered mind and the power and subjugation of the body. Charly captures the formative experiences of today’s young women from the poignant to the prosaic in writing that is at once witty, wry and heartfelt. Wayward nights out that don’t go as planned; the righteous anger at those men with no talent or skill or smarts who occupy the most powerful positions in the world; the strange banality of madness and, of course, the hurt and indecision of unrequited love. To ask other readers questions about She Must Be Mad, please sign up. I don't read much poetry, and would in no way consider myself knowledgeable enough to rate a collection in terms of how 'good' it is. But what I do know, is that it's very rare that I find a poet I can fully understand, let alone connect with, but I felt both of these things whilst reading this collection. I wouldn't go as far as to suggest she's 'social media's answer to Carol Ann Duffy', but I think these poems will definitely appeal to many a millennial. Themes of love, mental health, body im I don't read much poetry, and would in no way consider myself knowledgeable enough to rate a collection in terms of how 'good' it is. But what I do know, is that it's very rare that I find a poet I can fully understand, let alone connect with, but I felt both of these things whilst reading this collection. I wouldn't go as far as to suggest she's 'social media's answer to Carol Ann Duffy', but I think these poems will definitely appeal to many a millennial. Themes of love, mental health, body image, and even in one case - Trump, fill out this collection of poems ranging in form from traditional verse, to prose poetry. Irregardless of this being a collection of poetry, I think this would appeal to fans of people like Lena Dunham, Caitlin Moran and Dolly Alderton. I've never read Rupi Kaur, but I would take a punt that fans of hers will like Charly Cox too. SHE MUST BE MAD was fun to read and had pretty easy language to follow. Also, the themes are totally fitting for women and girls in today's society. Overall, for a non-poetry reader like me (I mean seriously, I just generally don't understand poetry), 3 stars is pretty darn good! An honest, brave and emotional rollercoaster of a book. Charly illustrates her experiences of growing up as a young woman in this turbulent world with wit, humour and a raw sense of vulnerability that leaves you laughing, feeling and shouting THAT’S ME at the pages. There are some total standouts which lifts my overall experience of this collection of poems to a 4. There were definitely some poems I connected to more than others. I liked the smaller poems more than the prose pieces. It was good to see poems about weight and self confidence although some of them I think the phrasing could have been chosen a little wiser. Still it was a good topic to bring up. Strangely I just didn’t connect with this poetry, despite the themes being relatable. This book of poetry and prose is divided into four parts/themes. However I feel like this is the biggest downfall. While Charly has a great rhythm (unusual in the era of instagram/tumblr poetry) the themes of the imposed four parts appear equally. It just sort of felt clunky but that's really the only fault. There's a nice use of language. Again, a great sense of rhythm. The themes touched on are very universal for younger women today (and teens even). Funnily enough, my favourite bits of this book were the prose parts, rather than the poetry. Charly really has a way with words. Despite the relatable topics and the easy language I could not get into this book at all. I found it to be a little pretentious and a little boring. Taking into account her age, and perhaps lack of life experience I feel as though this book was trying to hard to be deep and relatable rather than being deep and relatable. Also this may be controversial but there is a huge amount of this book dedicated to Cox's body issues. She frequently uses the word "fat" to describe herself. Doing one quick sear Despite the relatable topics and the easy language I could not get into this book at all. I found it to be a little pretentious and a little boring. Also this may be controversial but there is a huge amount of this book dedicated to Cox's body issues. She frequently uses the word "fat" to describe herself. Doing one quick search will bring up her instagram which will show she is not now nor ever has been fat. I 100% understand that someone who is a size 0 can still feel fat. I just don't know what message this sends. When someone who is a size 2 claims to be fat to a huge audience what will they think of themselves? If a fan sees that she calls herself fat and the reader is a size 4 or higher what will this do to their image of themselves? Body positivity is a big headline and focus right now. I feel like maybe the author was jumping on the popularity of this topic rather than being truthful or real. It came across as disingenuous and pretentious. The prose poetry was definitely my favourite bit. 2 stars for the two or three poems I liked. When you start to read a book and you know, you know know you would roll your eyes and avoid the woman telling her story ? We're way too different, and apart from these two or three gems, I felt annoyance and boredom. A whole part on your weight, really ? I was expecting to really like this collection but it just fell very flat for me. I couldn’t resonate with many of the poems, and most of them hadn’t felt profound enough to create an impact. My favourite part was mainly the prose poetry and sadly there wasn’t much of it, just at the start and end of each section. There were some great moments in this, however overall it wasn’t particularly thought-provoking or novel for me. I would be interested to see what she’s writing when she’s a little older though, you can tell this is written by a 22 year old. An opinion on this book before I read it said "perfect for young women in their 20s experiencing & learning about love and mental health" and I couldn't agree more. A must read - especially for poetry lovers! Honest, coming of age, organic yet mythical. A mix of imagery so creative and also very blunt and straight to the point. I had high hopes for this book as I had heard a lot of praise. However, I was ultimately disappointed with her delivery. Her rhyming seemed forced, messy, and unneeded. I much preferred her prose and non-rhyming poetry. And I found her voice very sarcastic and negative; not "Funny" as advertised. Her poetry was vague to the point that it didn’t hit me emotionally as I wanted it to. Her prose, with more exposition and context achieved this to greater effect. The book is advertised as “a call for c I had high hopes for this book as I had heard a lot of praise. However, I was ultimately disappointed with her delivery. The book is advertised as “a call for communion,” that “you are not alone” but though the poems meet the reader where they may be—in anxiety, or depression, or with body image issues—she doesn’t take them to that next step of hope or action. She leaves the reader in that negative space, and I don’t know that the communication of pure negativity without a foil has that much value for those already struggling. The ending of this little poem was so unexpected, I had to put down the book and laugh for a minute. It made it so honest and original that it absolutely had to be the quote I would use for my review. But oh well. Unfortunately I couldn’t relate to much else. There was also so much prose when I much prefered her short poems. This book of poems is written in four parts : She must be in love, She must be mad, She must be fat and She must be an adult. I can safely say that She must be fat saved my rating for this one. I related to all the poems in that section. I expected so much from this read but to be honest everytime I thought of finishing this book I just wasn’t excited to go back in. Until I got to She must be fat. I devoured that part. Unfortunately, it was the shortest one and I did not relate to many poems in the other sections. I wouldn’t not recommand this book though. I think that poetry is very personnal and my opinion is really based on my own experience. For some reason, I couldn’t connect with most of it but it doesn’t mean others didn’t. I’ve actually had many friends tell me they prefered the prose to the poetry for example. Este libro llego a mis manos de forma inesperada, no lo tenia visto pero encontrarlo firmado en una librería y con un título que me llamaba me impulsaron a llevarmelo. Es el primer libro de la autora y estoy algo en duda con su puntuación (esta entre 2,5 y 3). Reúne poemas y textos en prosa y se divide en 4 partes dedicadas al amor, la locura, la obesidad y la adultez, siendo esta última de mis favoritas. Tengo que reconocer que la autora logra que uno empatice con ella y con lo que cuenta en pr Este libro llego a mis manos de forma inesperada, no lo tenia visto pero encontrarlo firmado en una librería y con un título que me llamaba me impulsaron a llevarmelo. Es el primer libro de la autora y estoy algo en duda con su puntuación (esta entre 2,5 y 3). Reúne poemas y textos en prosa y se divide en 4 partes dedicadas al amor, la locura, la obesidad y la adultez, siendo esta última de mis favoritas. Tengo que reconocer que la autora logra que uno empatice con ella y con lo que cuenta en primera persona, más allá de lo lejos o cerca qué uno pudo haber estado de sus experiencias. Toca temas sobre los que me gustó y me suele gustar leer poesía, como ser el feminismo y el amor propio. Sin embargo, encontré el inglés algo complejo y eso dificultó mi conexión personal con el poemario. Encontré pocas frases o partes que realmente me llevó de el y esto es algo que busco en estas lecturas. No lo recomendaría para arrancar a leer poesía porque puede ser algo difícil y si no les gusta encontrar contenido relacionado a violencia, depresión tampoco lo recomendaría. En cambio, si como yo buscan descubrir libros del género, los animaría a darle una oportunidad, sobre todo si sienten atracción hacia alguna de las partes en que se divide. 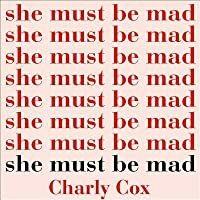 A new poetry collection from Charly Cox, ‘She Must Be Mad’ is a collection of honest and captivating poems that you won’t be able to stop reading. In two parts, one part love, one part mind, ‘She Must Be Mad’ keeps it real throughout as these words make an impact using a range of different poetry styles that make for such great reading. Poems such as ‘All I Wanted Was Some Toast’ in particular is a true reflection of the impact of depression on your life and I saw myself uncomfortably in words s A new poetry collection from Charly Cox, ‘She Must Be Mad’ is a collection of honest and captivating poems that you won’t be able to stop reading. In two parts, one part love, one part mind, ‘She Must Be Mad’ keeps it real throughout as these words make an impact using a range of different poetry styles that make for such great reading. Poems such as ‘All I Wanted Was Some Toast’ in particular is a true reflection of the impact of depression on your life and I saw myself uncomfortably in words such as this and that’s a rare and great thing. The diversity of emotions in this books from love, heartbreak and anger blend together beautifully next to one another. Poems such as ‘Trump’ are visceral and easy to like whereas poems such as such as ‘Love Part 2′ just strike you with honesty and that rawness of emotion that just makes for a poem that’s difficult to shake off. 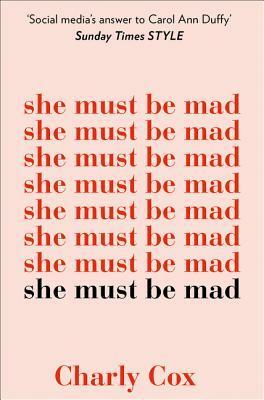 A book that grows up as it goes on, ‘She Must Be Mad’ is a brilliant and thought-provoking collection. The synopsis hits the description of this book just right when it says that this book is for every women surviving and thriving in today's world. This book is for more than just them though, this book is definitely for us! This book is a mixture of poetry and prose and just comments on everything we are thinking and feeling in today's society right now. I love how honest this writers is and how she really picks up on those little insecurities we all have, those dark thoughts in the deepest corner The synopsis hits the description of this book just right when it says that this book is for every women surviving and thriving in today's world. This book is for more than just them though, this book is definitely for us! This book is a mixture of poetry and prose and just comments on everything we are thinking and feeling in today's society right now. I love how honest this writers is and how she really picks up on those little insecurities we all have, those dark thoughts in the deepest corners of our minds and lays them out on paper here, opening them up right there for everyone to see. I love the balance of poetry and prose as well, I read this book in one siting but will definitely be adding it to my shelf so that I can pick it back up and look at specific thoughts or feelings again as and when I need to. I loved this book! It was bought for me as a gift and I couldn't be more grateful for it! I'm eighteen now but I wish I had this book in my early teens too. Nevertheless though, I'm glad I have it now. Charly Cox is amazing at making her experiences "relatable" - especially for young women and young girls. Would definitely recommend to all the women in my life! Of course there were some poems that I couldn't relate to but that's the beauty of poetry sometimes. It makes you understand how other p I loved this book! It was bought for me as a gift and I couldn't be more grateful for it! I'm eighteen now but I wish I had this book in my early teens too. Nevertheless though, I'm glad I have it now. Charly Cox is amazing at making her experiences "relatable" - especially for young women and young girls. Would definitely recommend to all the women in my life! Of course there were some poems that I couldn't relate to but that's the beauty of poetry sometimes. It makes you understand how other people's minds work and helps you delve into their personality a little more. As an aspiring writer myself this has given me the motivation to write a little more and be a bit more confident when showing other's my work.